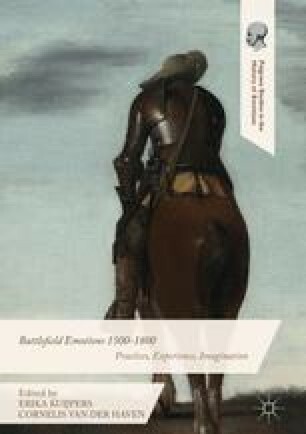 The ideas of William Reddy on the role of ‘emotives’ in prescribing normative emotional behaviours are a useful tool for deepening understanding of battlefield emotions in the French Revolution. The emotional suffering which Reddy argues was induced by the Terror in both supporters and opponents of the Revolution was particularly extreme for the soldiers who served in the revolutionary armies, as they sought to reconcile the contradictory imperatives of self-preservation and patriotic self-sacrifice. Although soldiers’ writings betray the influence of revolutionary ideology, they also bear witness to a wider range of emotional responses to the battlefield experience than the normative ones defined in propagandistic images. Close attention to the incidental details of contemporary accounts can be most revealing of the full range of battlefield emotions.